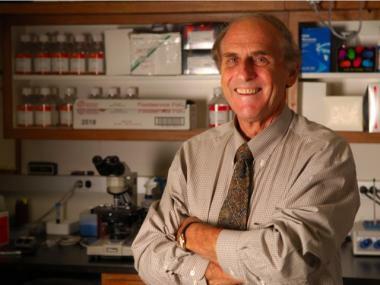 Ralph Steinman, a Rockefeller University scientist, was awarded the Nobel Prize for Medicine on Monday, Oct. 3. But he died on Friday, Sept. 30 before finding out. MANHATTAN — Rockefeller University biologist Ralph Steinman was diagnosed with pancreatic cancer four years ago and extended his life using dendritic-cell immunotherapy of his own design. He was honored on Monday with the Nobel Prize for Medicine for his discovery of the immune system’s dendritic cells, leading to new approaches in treating cancer, infectious diseases and immune disorders. The committee, however, did not realize that Steinman had passed away on Friday. Since Nobel Prizes are not typically awarded posthumously, there was a flurry of questions Monday morning about what would happen to Steinman’s half of the $1.5 million prize. Hours after the announcement — and after Rockefeller University's President Marc Tessier-Lavigne informed the Swedish-based organization of Steinman's death — the board of the Nobel Foundation met Monday and determined that the decision to honor Steinman's acheivements would be upheld. "The events that have occurred are unique and, to the best of our knowledge, are unprecedented in the history of the Nobel Prize," read a statement from the Nobel Foundation. The rules prohibiting the Nobel from being awarded posthumously remain unchanged, officials said. "However, the decision to award the Nobel Prize to Ralph Steinman was made in good faith, based on the assumption that the Nobel Laureate was alive," the Foundation's statement said. "The Nobel Foundation thus believes that what has occurred is more reminiscent of the example in the statutes concerning a person who has been named as a Nobel Laureate and has died before the actual Nobel Prize Award Ceremony," the statement continued. Nobel rules stopped allowing posthumous awards in 1974, unless a laureate dies after the announcement but before the Dec. 10 award ceremony, according to the Associated Press. This happened only once: in 1996 when economics winner William Vickrey died shortly after the announcement. But this was the first time Nobel officials believed a laureate had died before the announcement — without the committee knowing. Steinman shared the prize with American scientist Bruce Beutler and the French biologist Jules Hoffman. "The Rockefeller University is delighted that the Nobel Foundation has recognized Ralph Steinman for his seminal discoveries concerning the body’s immune responses," Tessier-Lavigne said in a statement. Steinman, born in Montreal on Jan. 14, 1943, came to the Upper East Side’s Rockefeller University in 1970 as a postdoctoral fellow after attending McGill University in Canada, Harvard Medical School and a residency at Massachusetts General Hospital. He has chaired Rockefeller’s immunology center since 1998. His early research at Rockefeller focused on the primary white cells of the immune system — the large “eating” macrophages and lymphocytes that “spot, apprehend and destroy infectious microorganisms and tumor cells,” according to school officials. He later zoomed in on dendritic cells, which he discovered in 1973, and how they played an important role in such immune responses as graft rejection, resistance to tumors and autoimmune diseases such as AIDS. Steinman is the 24th scientist associated with the university to receive the Nobel Prize, Rockefeller officials noted.